Dubai, UAE: Daimler Commercial Vehicles MENA FZE and Mercedes-Benz Trucks have celebrated the occasion of 20 years of Actros in the Middle East and in North Africa (MENA). The celebration took place on November 9, 2016, in Dubai. 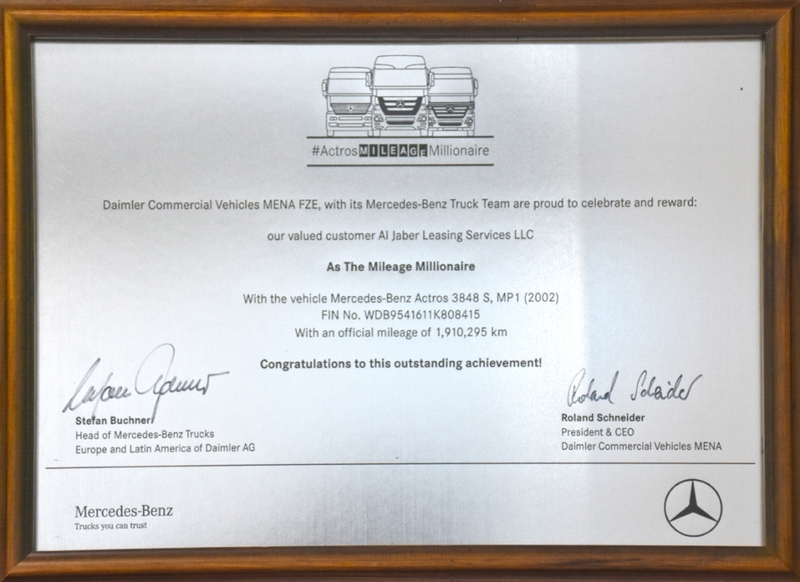 Al Jaber Leasing Services was rewarded as the leading ‘Actros Mileage Millionaires’ for reaching mileages of 1,910,295 kilometers since its launch in the fleet of Al Jaber Leasing Services in 2002. Roland Schneider, President & CEO of Daimler Commercial Vehicles MENA: “After having reached the milestone of 100,000th Actros sold in MENA in September this year, we are now delighted to reward our valued customers as ‘Actros Mileage Millionaires’. Our Actros proves day-to-day what robustness and reliability means and our customers know that the Actros is a real ‘Truck they can trust’. Al Jaber Leasing Services received a ‘Rejuvenation Package’ for its truck, containing a customized bundle of Mercedes-Benz GenuineParts, MB Oil, and other original fluids, equipping the award trucks for the next million kilometers. During the event, the latest model Actros 3844 S tractor-head was revealed, featuring a special ’20 years of Actros’ branding. The truck is equipped with a highly fuel-efficient 6-cylinder engine (Euro 3) boosting 435 hp, combined with the comfortable 16-speed Mercedes PowerShift automated gearbox.